This week we read that on 22 March 1820, Commodore Stephen Decatur, hero of the “Old Navy” for his daring exploits against the Barbary pirates, met Commodore James Barron on the infamous dueling field at Bladensburg, Maryland (now the town of Colmar Manor), just outside Washington DC. The dispute appears to have arisen over Decatur’s role in opposing Barron’s re-entry into the Navy five years after a Navy Board (upon which Decatur sat) ejected him from the Navy. Barron’s offense had been the ignominious but quite proper surrender of his ship Chesapeake after brief but futile combat with the British ship Leopard early in the War of 1812. According to duel witnesses’ descriptions(1), both men fell, seriously wounded. Two surgeons were nearby – Bailey Washington and Samuel R Trevett – but we have no details of any treatments given. Barron recovered from his wounds; Decatur died 12 hours later. In the old Navy, Paulin records no fewer than 8 surgeons or surgeon’s mates (junior surgeons) as dueling principles in 82 duels recorded between 1799 and 1850. Three surgeons died, one was wounded; one surgeon killed his opposite, another wounded his; outcomes in the rest weren’t reported. Navy regulations, a culture opposing the dueling tradition, and, perhaps, more important things to do, all conspired to bring this sordid business to an end in our Navy. In the last recorded old Navy duel, Lieutenant Charles F Flusser met an unnamed opponent in Rio de Janiero. Both men were wounded. The surgeons’ actions have not come down to us. (1) Paulin, Charles Oscar, “Dueling in the Old Navy”, Reprinted from the United States Naval Institute Proceedings, Vol. 35, No. 4, Whole Number 132, pp 1182-83, http://books.google.com/books?id=rV0vAAAAYAAJ&printsec=frontcover&source=gbs_ge_summary_r&cad=0#v=onepage&q&f=false accessed 28-29 March 2012. (2) Krystal, Arthur, “En Garde!” – The History of Duelling”, New Yorker, March 12, 2007, http://www.newyorker.com/arts/critics/books/2007/03/12/070312crbo_books_krystal#ixzz1qXVGwWwx, accessed 28-29 March 2012. (3) PBS American Experience: “The History of Dueling in America”, http://www.pbs.org/wgbh/amex/duel/sfeature/dueling.html, accessed 28, 29 March 2012. (4) The Project Gutenberg EBook of The Code of Honor, by John Lyde Wilson, http://www.gutenberg.org/files/6085/6085-h/6085-h.htm#2HCH0006, accessed 29 March 2012. (5) From Chapter VIII, “The Great French Duel” in “A Tramp Abroad”, originally published in 1880; converted to HTML by Alan Eliasen for the Mark Twain Library, http://futureboy.us/twain/tramp/tramp.html, accessed 29 March 2012. (6) Keane, MD, James R, “Dueling Doctors: Physician Duels” posted online at “Medscape Family Medicine News”, 9/1/2000, from South Med J. 2000;93(9) © 2000 Lippincott Williams & Wilkins, http://www.medscape.com/viewarticle/410621, accessed 28, 29 March 2012. This past weekend, I had the pleasure of attending the annual Naval War College brief given in northern California. This symposium – originally intended for the Naval Reserve community in the San Francisco Bay area but now open to the public by advanced registration – has been going on for several years: four professors from NWC give a two-day overview of the geostrategic situation, and the U. S. Navy’s role in it. This year’s Symposium was entitled “US GRAND STRATEGY DOES A REGIONAL REFOCUS: WILL THE U.S. NAVY BE READY”. What a lot there is for a non-policy wonk to learn! First: in January of this year, President Obama announced a new national defense guidance, entitled “Sustaining Global Leadership: Priorities for 21st Century Defense“. In this document – as the professors describe it – the President lays out a strategic “pivot toward Asia”. As we wind down our involvement in central Asia (Afghanistan) and the Middle East (Iraq), our national focus turns decisively toward the western Pacific, and in particular toward China. The professors described several and extensive interviews with Naval leadership at the highest levels and their message is “we are completely in agreement with this strategic pivot”. In his sessions, Doctor Toshi Yoshihara from the NWC China Maritime Studies Institute discussed the newly aggressive Chinese policy regarding the economic zone encompassed by the South China Sea. Professor Yoshihara also pointed out an associated policy expressing military reach to – and beyond – the “First Island Chain” – the rim of (mostly island) nations (Japan, Taiwan, Philippines, Indonesia, Australia, Singapore) and the islands (with under-water resources) lying within their territorial waters – just off the Chinese mainland. It’s interesting to observe these nations’ response: increasing their defense budgets and sidling up to the US. What’s especially remarkable in this context is recent gestures by nations like Vietnam and the Philippines to “tilt” toward the US. The Professors went on to provide snapshots of the rest of the world: the middle powers in the western Pacific (Doctor David Cooper, Chair of the National Security Affairs Department): nervous and “tilting toward the US”; Africa: “So Much Coast, So Little Navy” (Doctor Richard Norton, National Security Affairs Department): problems with piracy and a lot of resource extraction by China and – India! ; a newly emerging Russian navy (Doctor Thomas Fedysyn, National Security Affairs Department): visits to 7 nations in 2002, 37 last year – showing the flag and promoting Russian commerce; South America (Dr Norton), with an interesting observation that the Brazilian government has announced the intent to build its own, domestic, nuclear-powered submarine. And more. One thing sure: even if one’s focus is in the past, it behooves us all to inform ourselves about the future. Seminars like this one are invaluable, and the Naval War College Foundation, which sponsors these events, are to be encouraged and congratulated. History, like Science, is, or should be, in a state of constant change as old information is refined in the face of new discovery. I experienced this very kind of change this morning. Sometimes, when I’m at a loss for a subject for these ramblings, I google “This Day in Naval History” and I’m rewarded with a link to the (U S) Naval History and Heritage Command’s “Dates in American Naval History” page. There, for instance, I learned that 9 March marks the date, in 1798, the “[a]ppointment of the first surgeon U. S. Navy, George Balfour”. With scant other material concerning this presumed Naval medical precedent-setter available on the internet, I turned to my trusty copy of Professor Harold Langley’s A History of Medicine in the Early U. S. Navy (Johns Hopkins Press 1995). In Chapter 2, “The Quasi-War with France”, Professor Langley carefully lays out the chronology of the provision of medical care for the now-famed Six Frigates being built and commissioned as the nucleus of the newly resurgent U S Navy. Inasmuch as the frigate United States was launched in May, 1797, its Captain, John Berry requested information regarding obtaining the services of a Medical Officer. The War Department ordered Dr George Gillaspy, then surgeon to the Second Infantry, to Philadelphia for this purpose. Gillaspy identified himself as “Acting Surgeon, Frigate United States” in late fall of 1797. He was officially ordered aboard the United States some time after 30 August 1797. On the other hand, according to Langley, Surgeon Balfour took up his duties aboard Constellation “in February or early March 1798”. Gillaspy is surely then the “first surgeon appointed to the U. S. Navy”. According to Professor Langley, “of the 12 surgeons appointed to the Navy in 1798, 2 died, 1 committed suicide and 2 resigned. Gillaspy, the first naval surgeon appointed, apparently made only one cruise. He returned to Philadelphia, formed a partnership with Surgeon’s Mate Joseph C Strong, and began supplying the navy with medicines.” He apparently gave up his pay and rations early in 1799, but kept his rank until he was discharged from service in April 1801. Balfour stayed in the service until 1804 when, facing orders to sea, he resigned his commission. All of the surgeons appointed in 1798 were gone by March 1805. Sic transit gloria mundi. Following the precedent of earlier conflicts, the Navy Medical Department leased resort hotels during World War II. They were commissioned to operate for the benefit of sailors and Marines recovering from the physical and psychic wounds of war. Today I highlight two of them. U S Naval Convalescent Hospital Glenwood Springs, Colo. 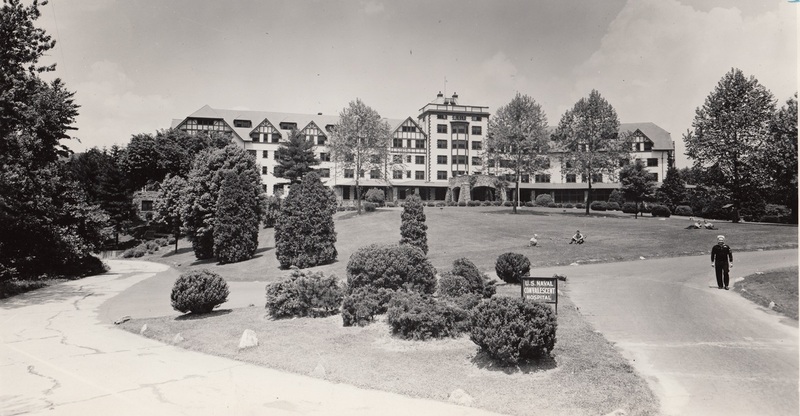 In “Know Your Hospital” mimeographed newsletters from March and April 1944, LT (jg) William X Heelan, (HC)*, USN, described the facility thus: “[It] was formerly the Hotel Colorado and was built by a British syndicate of investors in 1893. It is a six-story edifice constructed of native matched red sandstone and pressed brick, with a slate roof, and contains 250 guest rooms. 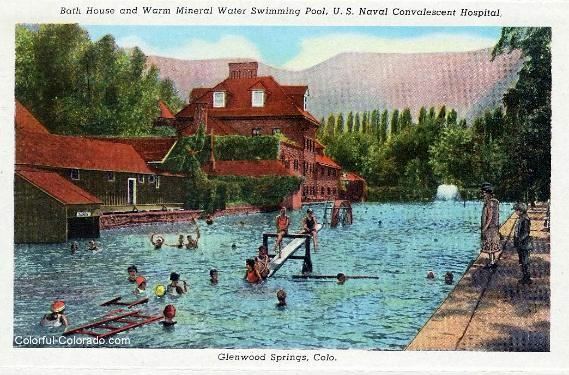 It appears that the facilities once encompassed by the Hospital are now operated as two separate facilities, the Hotel Colorado and Glenwood Hot Springs. The Hospital building is now listed in the National Register of Historic Structures, and is operated as the Kenilworth Inn Apartments. It is notable, I think, that such a premium was placed on quiet, sequestered and “peaceful” environs which would promote the healing of war injuries. Both facilities live on today, serving as retreats and domiciles. * Congress established the Hospital Corps of the Navy in 1898, to consist of Pharmacists (with rank equivalent to Warrant Officer), hospital stewards and hospital apprentices. With war time expansion in sight, new regulations permitted members of the hospital corps to receive commissions as officers (not Warrant…) wearing the hospital corps caduceus. These officers were offered conversion to the Medical Service Corps when it was established in 1947. See http://www.history.navy.mil/library/online/uniform_insignia.htm, accessed 2012Mar09. If you walk into your community Historical Society or Museum, you’ll likely find it staffed by retirees – volunteer footsoldiers defending the ramparts of local history against the dual assaults of time and indifference. Local historical establishments are typically underfunded, even neglected, especially in times of economic distress. In my community, the museum lost its modest ($35,000) annual grant from the city when the city went bankrupt. The single paid (and very modestly at that) professional Museum Director has to divide his time and energy between what he’s there for – preserving and displaying local history – and the much more onerous task of raising funds. His volunteer Board and staff struggle doggedly, enthusiastically, to keep the place open. Our local Historical Society fell on hard times several years ago as the original organizers aged and died off – and were not replaced. Its current president, a young woman degreed in history, volunteering her time and energy, has virtually single-handedly brought the organization back to life. At the same time, again almost single-handedly, she recently snatched a local structure from the jaws of developers who would have destroyed an architectural and historical treasure. The County Historical Collection (it doesn’t have official “archives” status despite its being a repository of county governmental and court records reaching back to the County’s establishment in the 1850s) is managed by a trained archivist who works at least forty hours a week – as a volunteer. The County budget to operate the place (aside from power and light) – $3500 a year – was just cut to zero. The archivist is now contemplating setting up a 501(c)(3) charity to fund her operations because she fears that without any money, and without official status, the records she and her volunteer crew access, catalog, restore and preserve, could end up in the dumps, where, at one time in recent past, they were consigned. Could this be the situation in your locale? What to do? First, of course, is to learn about your local historical establishments – simply become aware of their existence. Then, you can begin to learn about their status and their needs. Once you understand their situation, you likely will want to help by writing a generous check every year, by becoming part of the volunteer staff, or even serving on the Board of Directors where you will play a key role in raising funds. I guarantee this: you, your energy and your expertise will be welcomed, warmly. Double this if you bring skills and knowledge as an historian or an archivist! Once you’re “hooked” you can help raise consciousness of local history (and of those that are “doing” it) to the larger community. For instance, as President-elect of my Rotary Club, I just sponsored a “History Month” by inviting the above-mentioned Museum Director, Historical Society President, the County Archivist, and the president of a local historical foundation to speak at our weekly meetings. Many of my fellow Rotarians – community leaders and opinion influencers all – came to me during this series to declare that they had been completely unaware of the activities, even the existence, of some of the organizations we highlighted. Think about this: you could even take a “local history status report” on the road. Service Clubs, Chambers of Commerce, PTAs all have vital interest in local cultural and educational resources. They also are always on the lookout for good speakers! The whole idea: get people informed, interested and involved in their history. So, in 2012, make yourself into a leader in the battle against the assaults of time and indifference upon our history.